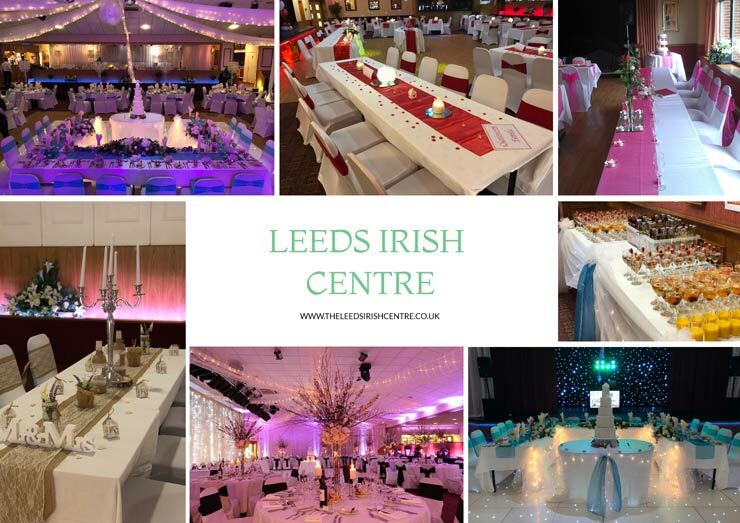 The Irish Centre provides four Air Conditioned Function Suites which form an adaptable yet friendly atmosphere for whatever occasion you are celebrating. From Gigs and Concerts accommodating up to 800 people to individual Function Rooms providing for 100 to 350 people we can provide for all your entertainment requirements. Couple that with our renowned catering provided by our own onsite Kitchens and Chef''s we can undertake any function Weddings, Birthdays, Communions, Christenings, Funerals, Boxing Tournaments, Conferences or a Celebration Dinner. Why not come along speak to our professional staff, who will facilitate your every need and budget. Come and see our superb hospitality for yourself. We believe we have the perfect venue for your special day. Come to The Leeds Irish Centre. Don't risk your wedding reception to just anyone, trust it to us - your total entertainment solution. Our professional wedding co-ordinators will help you plan the occasion and be in attendance throughout the day to ensure absolutely everything runs as smooth as silk and your perfect day will be a memory you'll treasure. Everything at The Irish Centre is tailored to your needs. Your guests are always ensured of a friendly, efficient service. We will ensure that you want for nothing from the bar, and that your food is brought to to your table with punctuality. We are not tied to the rules and regulations of large hotels and conference centres, and are determined to offer a personal service that is difficult to beat. Each of our Function Suites has dedicated kitchens so will not find us trying to run a number of functions from one main kitchen. We are happy to discuss any special arrangements that you may wish to make. We can accommodate special dietary requirements, organise a toast master, or source specific drinks. Just ask... See more info about Wedding Receptions here. "Fantastic night, really good venue and music. Atmosphere was great and staff were all really good." "Been several times for gigs and party's, this time for the excellent St Paul and the broken bones. Friendly, cheerful and efficient staff. Great atmosphere but never crammed in like some other gig venues we visit. The only downside is that being on the short side the bar is to high for me but that's my problem and not yours. Hope to visit again soon." "This is 1 of mine (our) main local to go for a drink, always made to feel welcome by everyone & always put on a good show & parties etc. Keep up the good work." "We have held many charity evenings here over the years; the team have always gone out of their way to accommodate us and ensure our events are a success. Highly recommend!!" "The best club in Yorkshire for all Gaelic games and every body so kind and friendly had brilliant time there last night with all the Connemara lads well done the Irish centre for everything Irish"
"Had my husband's 60th in the O'Meara Suite on Saturday - absolutely fantastic. The bar staff were so accommodating and Christie was lovely as always. Over the years my family (Foy's) have had many weddings, parties, christenings and engagements. It's the place to be - Julie and Cath are really helpful and cannot do enough for you. Also Alan's catering is amazing and that 'Bouncers' as polite as can be. "Never had a bad night in there and the people are so friendly bar staff always very happy to help you we had family party’s there can’t do enough for you"
"Had my 50th birthday there. The staff were welcoming, helpful and genuinely cared how the night went, even helping with food deliveries and elderly relatives. From Julie in the office, to the doormen, to the bar staff -Totally recommend!" "This place means so many different things to so many different people. From Irish dancing/music to the various societies and sports clubs that hold regular meetings/practice sessions or events at the IC. A true chameleon- Keep up the good work"